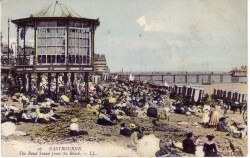 The Eastbourne Local History Society has created this timeline from their archive of historic pictures and artefacts. 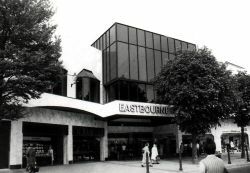 If you have any historical images or artefacts that would be suitable for inclusion in the Eastbourne Timeline please contact the Society. Stretches from Langney to Pevensey Bay, replacing most of the Crumbles, and providing an outer harbour and inner marina of 65 acres of water with 365 acres of good quality housing and commercial property. 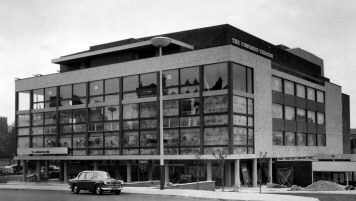 A modern covered shopping complex built on the site of Ashford, Tideswell and Junction Roads, including shops fronting onto the pedestrianised Sussex Gardens part of Terminus Road. 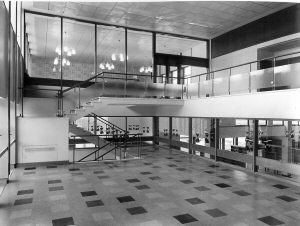 Built on the bombed site of the former Library and Technical Institute at a cost of £144,000 , with an adjoining Council Office block and underground theatre. 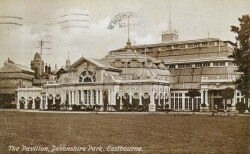 The Indian Pavilion in Devonshire Park was demolished to make way for the Congress Theatre complex. The bombing of Caffyn's Garage. 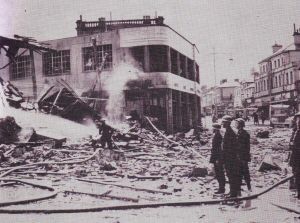 Between 1942 and 43 Eastbourne was the target of German 'hit and run' raiders, making it the most bombed town on the south coast. Built in an Art Deco style at a cost of £29,000. It established a fine tradition of Military band music over the years. 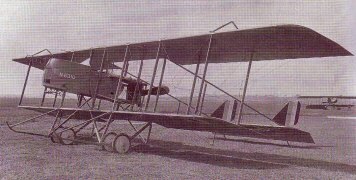 Founded by Bernard Fowler, four aircraft were built and 19 airmen trained before war broke out. Thereafter the airfield became a RNAS Training Station at which over 120 men learned to fly. Some 250 aircraft were built at the Seaplane Base factory. A unused chalk pit was laid out as an Italian Garden at a cost of £400. The name originates from a small fishing hamlet further west. Built at the junction of Grove and Orchard Roads on land given by the Duke and supported by a donation of £10,000 from Andrew Carnegie, the Scot born American millionaire. 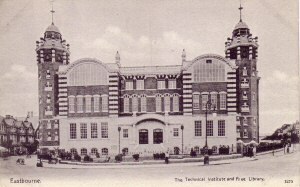 It contained a Free Library, Museum, Municipal Boys' School and School of Art. Destroyed by bombing in WW2. 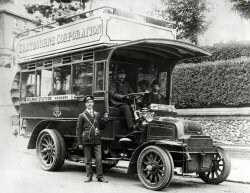 Eastbourne's was one of the very first municipal 'bus services. The earliest buses had an open driver's cab, no number plate and were painted in a red/brown livery. 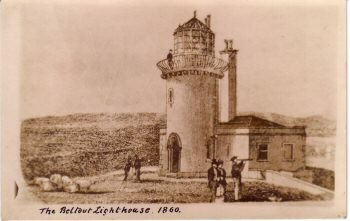 Built of Cornish granite at the foot of the cliffs, this lighthouse replaced the earlier Belle Tout on the cliff top. It was automated in 1983. 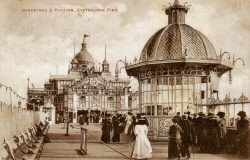 Built at a cost of £300 and known as 'The Birdcage', it lasted for 50 years. 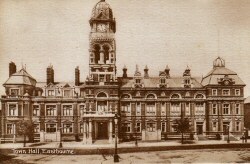 Eastbourne's Charter of Incorporation was granted on the 1st of June. 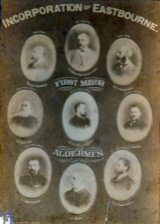 George Ambrose Wallis, the Duke's agent and an architect, builder and developer, was the first Mayor, following elections in November. Originally laid out with terraces, walks and cricket ground, later additions included tennis courts, racquets, a roller skating rink and a music garden. 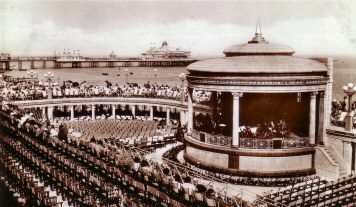 Bordered by the Devonshire baths (1874), the Winter Gardens (1875) and the Devonshire Park Theatre (1884). A beautiful avenue which is the focal point of Currey's design for the 7th Duke of Devonshire's town. 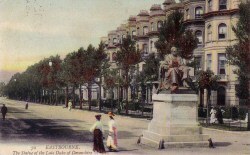 The Duke's statue sits at the seaward end. Established with the help of the Duke of Devonshire as an independent school 'for the sons of noblemen and gentlemen'. It now caters for the education of over 600 boys and girls, about half of whom are boarders. 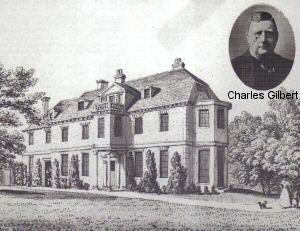 Dr Charles Hayman provided the stimulus which resulted in the building of the town's first proper drainage and sewer system. 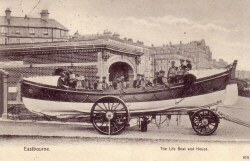 Designed by Eugenius Birch and built by the Eastbourne Pier Company for £15,000. It has been altered and repaired several times. Originally a landing stage for steamers, it also enabled the gentry to 'walk on water'. 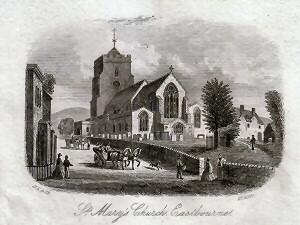 Responsible, through his architect, Henry Currey, for the elegant design of the town westwards of Devonshire Place, the Meads area and the Western Parades, which turned Eastbourne into a watering place for the upper classes. A branch line from Polegate to Eastbourne joined the town to the London, Brighton and South Coast Railway system. The station was originally a wooden hut near the southern end of the present Avenue. 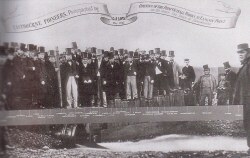 The coming of the railway accelerated the growth of the town. 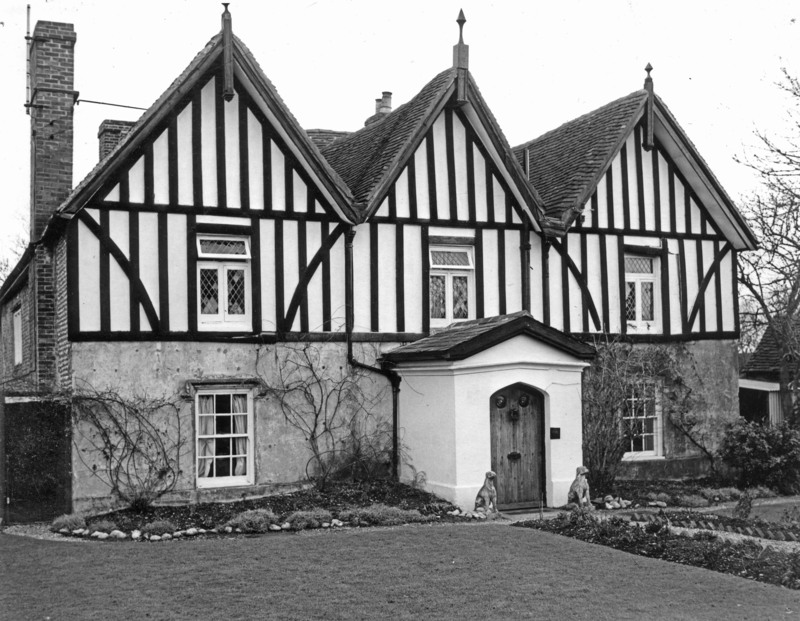 First constructed of wood by 'Mad Jack' Fuller, it was later rebuilt in stone. Still later, in private ownership, it was given to the Corporation in 1948. 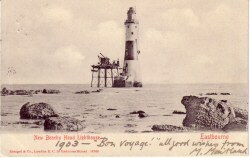 It is now privately owned and was moved away from the cliff edge in 1999. Built of wood by a local boatbuilder called Simpson following the wreck of the 'The Thames', an early Indiaman. Given by 'Mad Jack' Fuller of Brightling , MP and builder of follies, it was in service until 1863. 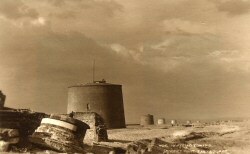 Built as a defence against Napoleonic invasion, the towers extended from Suffolk to Seaford. The Wish Tower is number 73. 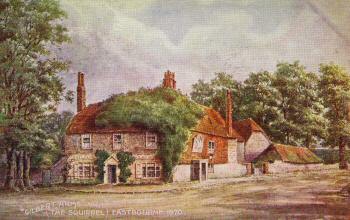 At the junction of Terminus and Grove Roads, formerly the Hartfield Farmhouse, it became an inn in 1849 and was popularly known as the Squirrel after the image on the Gilbert family arms. 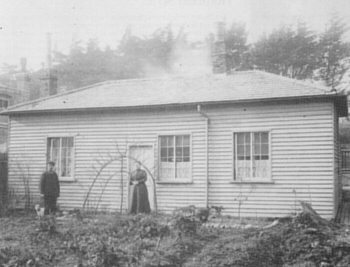 Demolished in the 1870s. Built by Dr. Lushington and purchased by Charles Gilbert in 1792, it became the Gilbert/Gildredge Manor House. Sold to the Eastbourne Borough for £19,000 in 1923 for use as the Towner Art Gallery, after Alderman Towner had left a bequest of £6,000 and his collection of pictures. A former horizontal windmill converted to a house by James Gandon. 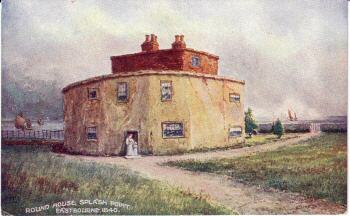 Near the site of the pier entrance, it was demolished in 1841. 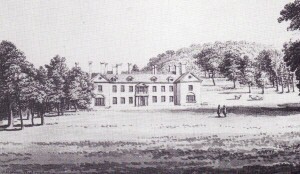 Used by Prince Edward in 1780 and later by other royal children. 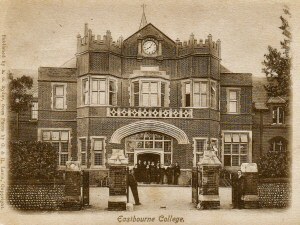 Built by James Burton, it is the only Grade 1 listed building in Eastbourne. It is one of the Eastbourne properties of the Dukes of Devonshire. Leased to a language school. In th High Street, Old Town, formerly assembly rooms and Ballroom. Renovated in 1912 when the plaster front was removed. Built in 1160 - 1190, the Parish Church was enlarged in the 14th Century and restored in the mid 19th Century. Many monuments to local families. 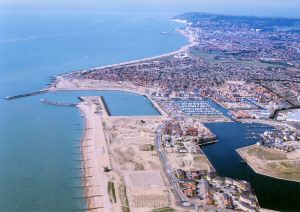 Eastbourne is recorded with population of 68 villeins and 6 labourers, with 28 ploughlands, a wooden church and Roger the Cleric, about 3360 acres (1000 hectares) in total: one church, one mill and a supply of salt pans. There is reference in the Anglo-Saxon charter to Burne or Bourne. An Anglo-Saxon cemetery overlies the Iron Age settlement on St Anne's Hill where weapons, jewellery, glass and pottery were recovered. Local Romans ruled from their sea view villa and developed the existing farm economy. Roman baths and pavements were exposed in 1712 and 1841 near the site of the Queens Hotel. The Shinewater settlement survived into the Iron Age. Pottery was made locally and imported. 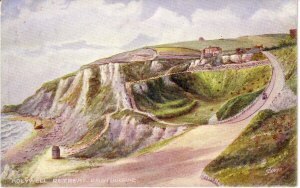 An extensive settlement existed on St Anne's Hill. Numerous burial mounds exist on the Downland. Exceptional bronze and gold work has been found in the cliffs and a Late Bronze Age lagoon-side settlement exists at Shinewater. Early farmers built the Neolithic causewayed enclosure on Combe Hill, created long barrows for their dead and possessed axes of imported volcanic rock. 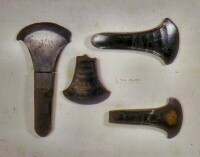 Flint hand axes and scrapers have been found on the Downs, together with waste flakes made by the knappers. While every effort has been made to contact the copyright owners of the pictures used in the Timeline, it is possible that some have not been traced. Those concerned are asked to accept the Society's apologies.